For absolutely no reason, I used to hate bands with female lead singers. Now, I’m obsessed with artists like Taylor Swift and Kelly Clarkson. Turns out, girl bands and artists are pretty good. I agree with you..then came Paramore and the sudden want to be apart of a rocker all-girl band…This band is great Lindsey! You should check out more of their songs or plug them into Pandora. I’ve found a few other “unknown and unrated” songs that way! It would be so cool to be in an all-girl band. Let’s just start one. Even if we’re not any good. We can even do our own PR for ourselves! I never really paid attention to bands with all women musicians until I got the opportunity to see Beyonce live a few years ago. Her entire show was dedicated to the power of women and her extremely large and very talented band was entirely made up of women. I found this to be such an interesting part of the show and really made me gain insight to Beyonce’s beliefs and her stance on the power of women! 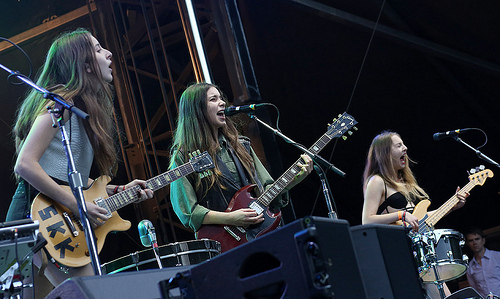 I have never heard of HAIM before but I am willing to give them a try. I think since the Beyonce concert I have become more aware of all women bands and how incredibly unique and moving they really are. I would highly suggest if you ever get the opportunity to see Beyonce in concert to definitely take the chance, but if not you should look up some of her Youtube videos of her band. I think you would really enjoy it and I will continue to listen to HAIM and spread the word about their awesome talents. I’ve always really enjoyed watching Beyonce on music awards, so I will definitely love to see her in concert. Only problem with big names is it’s hard to get close without spending hundreds of dollars. I listened to The Wire song by HAIM. I never heard them before and I enjoyed listening to them. I do not know why, but it always stings when people say “I do not like female singers.” Or the person might say a similar comment. It really shows how someone is closed off in their music when saying statements like that. I wonder why so many people do not try to listen to other kinds of music that they do not normally listen to. I know quite a few people who are closed off in music and only listen to a certain genre. I like all kinds of music and it is very diversified. My playlist has all kinds of music from opera, American and even Italian pop, R & B, rap/hip-hop, alternative, rock, and the oldies. I get a sense of other cultures by listening to their music. My opinion may have a factor to how open I am to other cultures in general and love learning about other countries. I am also tired of listening to the same artists all the time and the same songs for what actually is 5 or 6 months straight on the radio in the car. I have noticed that there are newer and newer artists that come out on the radio more and more. Since the last few years, it seems that artists that were not as globally known are becoming globally known. I think it is a little bit easier today for a small band to rise up and get globally recognized. We are becoming more and more global in recent years and will be more in the future. The well-known celebrity names like Britney Spears and Beyoncè will not be the only ones playing on mainstream radio, but new artists will be on the top of the top-selling list as well. I usually don’t listen to girl bands because they all seem the same. After watching the Video for Haim, I really liked the way they portrayed their video. It was a song that had a fun story behind it but it let me know that “everything is gonna be okay”. If I usually listen to a band, it is a male based band but I never have that feeling of just jamming out with my best friend unless I’m listening to a female artist. A new interesting artist that you may like is Lorde. She currently has the new hit song “Royals” (which i sing about 3 times a day). She has other catchy songs that you can roll the windows down and just vibe. I just wish they didn’t play the song a million times on the radio! Thanks for leaving such a great comment 🙂 you really studied what I wrote!